Changes made by the government to university tuition fees in England are as likely to cost public money as save it, experts say. The Higher Education Policy Institute (Hepi) re-evaluated the plans in light of concessions made shortly before MPs voted in favour of raising annual fees to up to £9,000. It concluded that if any savings were made, they would be marginal. The government said the reforms were fair and "affordable for the nation". Hepi re-examined government plans to change England's higher education system, which involve removing the teaching grant and replacing it with higher fees for students, after MPs voted through the controversial move last week. Fees would rise from about £3,000 a year to a maximum of £9,000. Students could take out government-funded loans which they would start to pay back once they earned £21,000. One of the concessions was to annually increase the £21,000 repayment threshold, rather than every five years, as had been planned. Hepi said the annual uprating of the threshold "will add substantially to the cost, and we have calculated that on the basis of this further concession alone the government's assumed savings will be wiped out if graduate earnings increase by 3.75% per year instead of 4.47%. "That is to say that if the earnings increase falls short of the government's assumptions by just 16%, there will be no savings." 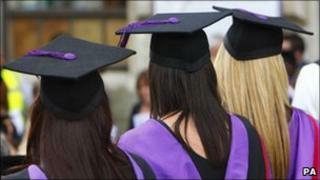 It had said that the government's proposals were "extremely sensitive" to assumptions about future graduate earnings. "And for that reason we think it would be wise to assume that savings, if any, will be marginal, and indeed that the government's new proposals are as likely to cost as to save public money," it said on Tuesday. The government has assumed that universities will charge an average of £7,200, but Hepi said that without any controls to keep fees at the lower end of the scale, it was still possible that the average fee would be "considerably higher" than the government had allowed. "This makes a large difference to the cost and savings that the government can expect, because the higher the level of the fee that is charged, the greater the loans that will be required, and because the loans are subsidised, the greater the cost to the government," it said. A spokesman for the Department for Business, Innovation and Skills said: "Our student and university finance reforms are fairer than the present system and affordable for the nation. "No student will be asked to pay upfront costs, there will be more financial support for poorer students and those who go on to earn the highest incomes will make the largest contributions after they have graduated." The government used Treasury assumptions about future levels of economic activity and wage growth, he said. "Universities who want to charge more than £6,000 per year will have to meet much tougher conditions on widening participation and fair access," he added.